A former laundress who became a millionaire from her hair-care company, Madam C. J. Walker (1867–1919) was a leading philanthropist of the early 1900s. Because of her pioneering role in both business and philanthropy, she's featured in two museum exhibitions: American Enterprise and Giving in America. Her biographer, Dr. Tyrone Freeman, answered three questions from our philanthropy curator, Amanda Moniz, about Walker's giving. 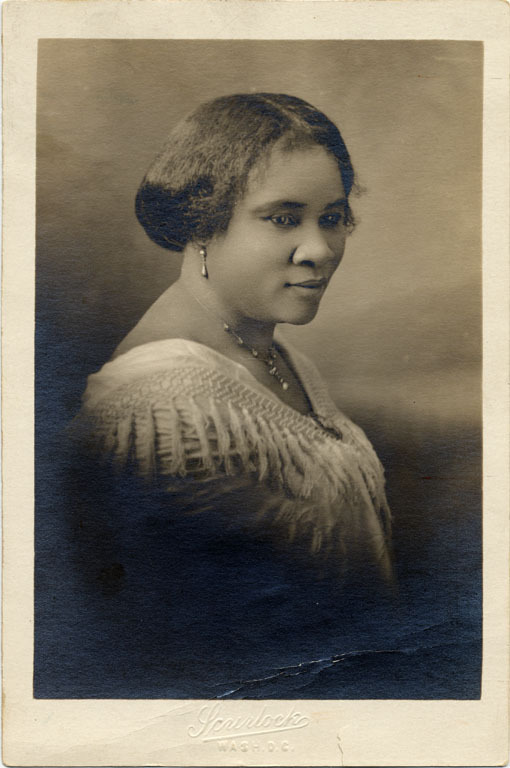 Portrait of Madam C. J. Walker, taken in 1915. Courtesy of Scurlock Studio Records, Archives Center. What sort of causes and institutions did Madam C. J. Walker support and why? Before she became famous, Sarah Breedlove, aka Madam C. J. Walker, was an orphan, child laborer, teenaged wife and mother, young widow, and homeless migrant. She knew firsthand the struggles of being poor, black, and female in the emerging Jim Crow South. Her philanthropic giving was focused on racial uplift, which meant helping African Americans overcome Jim Crow and achieve full citizenship. She gave money to local, regional, national, and international organizations that were typically founded by or focused on serving African Americans. Her racial-uplift giving was primarily directed toward black education and social services. She gave to black colleges and secondary schools like Booker T. Washington's Tuskegee Institute, the Palmer Memorial Institute in North Carolina, and the Daytona Normal and Industrial Institute in Florida, because Jim Crow laws denied her an education during her childhood in Louisiana and Mississippi. For social services, she gave to organizations such as the Flanner Settlement House in Indianapolis, the Alpha Home elder-care facility in Indianapolis, the St. Louis Colored Orphans' Home, the St. Paul's AME Mite Missionary Society in St. Louis, and to the international and colored branches of the YMCA. These organizations were on the ground responding to the basic needs of African Americans related to discrimination, food, healthcare, housing, daycare, and community development. 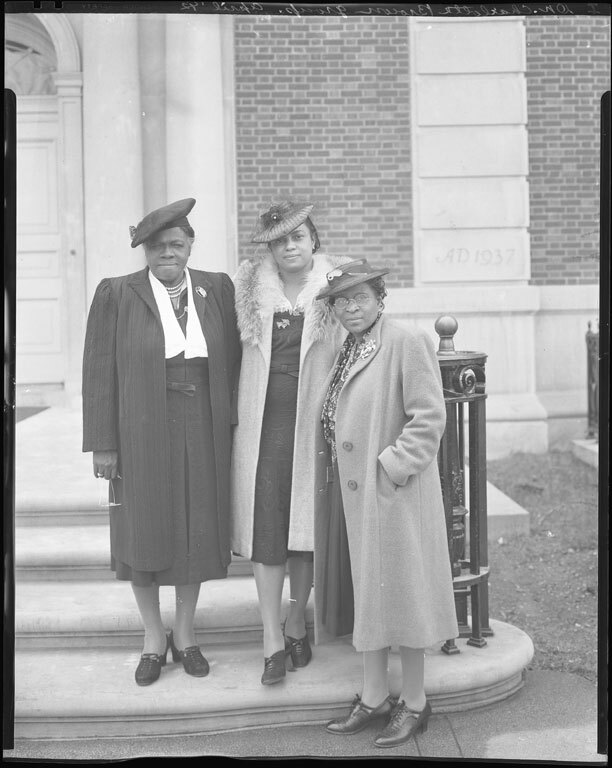 In this 1942 photograph, Dr. Charlotte Brown, Mary McLeod Bethune, and another woman stand on the steps of a building. Educators and philanthropists, both Brown and Bethune opened schools for African American students, in addition to other forms of philanthropy. Courtesy of Scurlock Studio Records, Archives Center. Some of these organizations, and others she supported, were run by women leaders, like Mary McLeod Bethune and Charlotte Hawkins Brown—which was important to Walker, too, as they were fellow race women and friends. To help the NAACP fight lynching, Walker also made important direct and estate gifts, which the organization later credited with helping it to survive the Great Depression. How did her business practices inform her philanthropy? Walker's attorney and confidante, Freeman B. Ransom, called the Walker Company a "race company," which meant it was founded by African Americans for the betterment of their own community as they fought against racial discrimination. This orientation framed both the commercial and philanthropic purposes of the company. Through this lens, employment as a Walker agent created a philanthropic opportunity for thousands of black women to support themselves, their families, and communities in spite of Jim Crow's restrictive laws and customs that deliberately locked them out of labor markets. Additionally, education was an important philanthropic goal of African Americans given severe limitations on their learning under Jim Crow. The Walker network of beauty schools provided education and a career path for black women toward credentialization and gainful employment in the respectable profession of beauty culture. In this way, the opportunity to become educated was a gift that enabled thousands of graduates around the country to improve themselves. 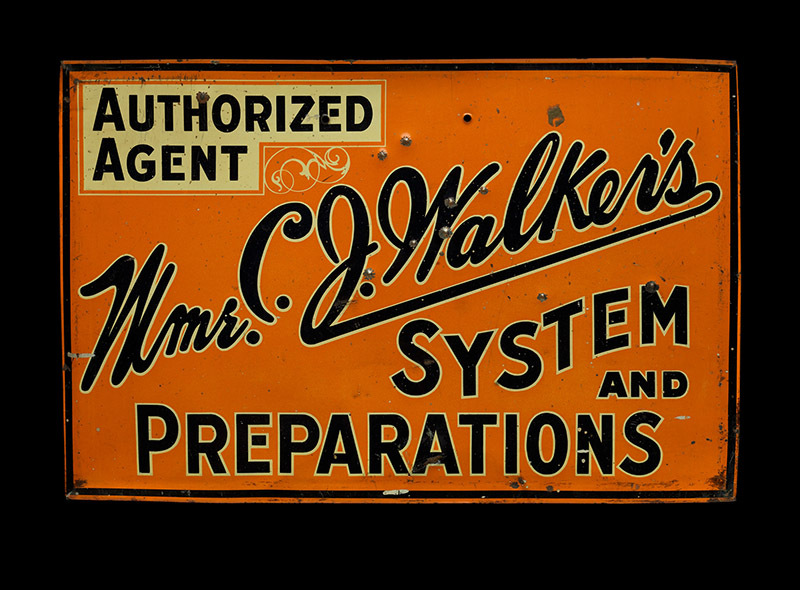 This sign identified salons that were franchises of the Madam C. J. Walker Company. African American women without access to bank loans during segregation often became franchisees in order to become entrepreneurs. Franchises with the Walker beauty company allowed thousands of black women to launch their own businesses. This sign belonged to Marjorie Joyner, vice president of the Madam C. J. Walker Company and a friend of Walker's. Walker also organized her agents into local and national clubs so they could not only sell products and raise the profile of beauty culture as a profession, but perform charity and activism work to address community needs and national issues such as fighting lynching and supporting black soldiers in World War I. Lastly, the company served as a foundation of sorts for Walker because her charitable giving was typically run through the company, with Ransom serving as her philanthropic adviser and administrator of gifts. 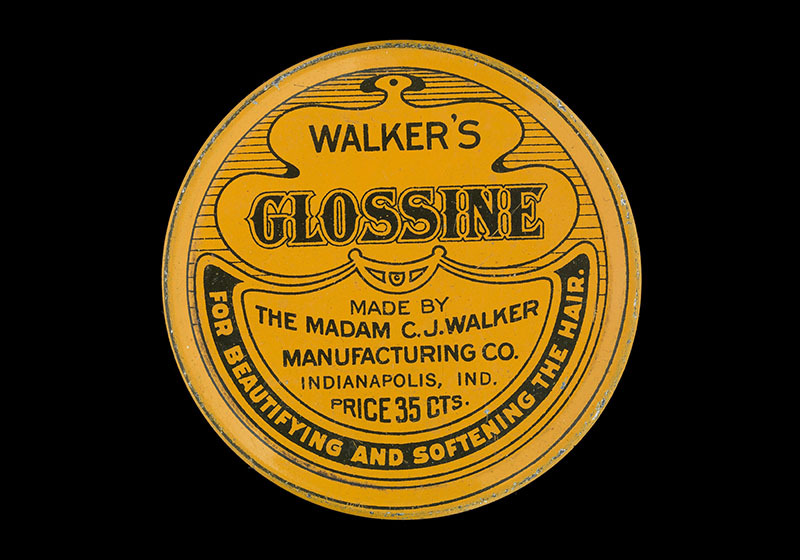 Madam C. J. Walker's company also sold hair care products like this glossine, used for beautifying and softening the hair. What can Madam C. J. Walker's experience tell us about the history of American philanthropy? Madam C. J. Walker's experience grew out of black women's historical experience of America. She represents black women's daily ways of giving in their communities to survive in America, and to express and preserve their dignity and humanity. She is an important historical marker of the long-standing and deep-rootedness of African American philanthropy—it is not new and emerging. It predated Walker, and it vibrantly continues to this day. While she was a contemporary of the white philanthropists who often dominate our historical understanding of early-20th-century American philanthropy, she presented a different and much more accessible way to do philanthropy, regardless of one's station in life. She challenged the accumulation-of-wealth model of philanthropy, which postpones giving until the twilight years of life. She demonstrated that anyone can give and be a donor with whatever resources—monetary and nonmonetary—they happen to have at the time need is observed, and that as one's resources increase, so should one's giving. Tyrone McKinley Freeman, Ph.D., is assistant professor of philanthropic studies and director of undergraduate programs at the Indiana University Lilly Family School of Philanthropy. He is an award-winning scholar of the history of philanthropy in communities of color and co-author of Race, Gender, and Leadership in Nonprofit Organizations. He is currently writing a book about Madam C. J. Walker and black women's philanthropy. Amanda B. Moniz, the interviewer, is the David M. Rubenstein Curator of Philanthropy in the Division of Home and Community Life.